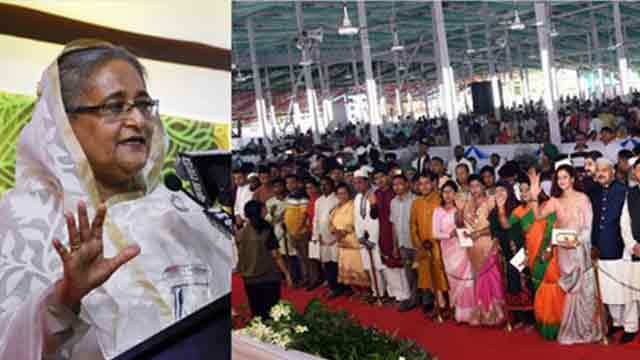 Dhaka, Aug 22 (Just News): Prime minister Sheikh Hasina said on Wednesday that her government has taken all necessary measures so that people can travel to their village home to celebrate holy Eid-ul-Azha with their kith and kin. The prime minister said this while addressing the visitors came to greet her at Ganobhban official residence on the occasion of holy Eid-ul-Azha’. “We have tried to put in place a better communication and law and order system so that people can go to their village home to celebrate the Eid with their kith and kin and come back to Dhaka without any hazard,” she said. In this month, she said, we have lost our many leaders and workers including Ivy Rahman in the heinous in grenade attack on 21 August 2004. “Even bearing a great pain we are trying our best to build a better Bangladesh where people will be able to live in peace and prosperity,” she said. “Our duty is to serve the people as Father of the Nation always dreamt of building a happy and prosperous Bangladesh,” she said requesting the people to pray on this holy day for the Father of the Nation and other family members. The gate of the Ganobhaban opened for visitors at 9.30 am when people from all walks of life started coming after their Eid prayers. the prime minister herself went to the visitor along different rows and exchanged greetings with them. On the occasion the big lawn of Ganobhaban was tastefully decorated. At the beginning, senior Awami League leaders and cabinet members greeted the prime minister by presenting her with bouquets. Leaders of different political parties, parliament members, freedom fighters, leaders of associate bodies of Awami League, different professional and trade bodies as well as a cross section of people including beggars and destitute exchanged Eid greetings with the prime minister. Like previous years, some of the visitors took the programme as an opportunity to draw attention of the top executive of the country to their woes and sufferings and sought her intervention and support to resolve those problems. A desk was opened in the Ganobhaban premises to receive the applications of the masses. The prime minister assured them of taking necessary steps after the scrutiny of their applications. Later, the prime minister exchanged Eid greetings with judges of the Supreme Court, senior civil and military officials and envoys of different friendly countries at a separate programme on Ganobhaban lawn. Chief justice Syed Mahmud Hossain, speaker Shirin Sharmin Chaudhury, prime minister Sheikh Hasina's sister Sheikh Rehana and other family members, chiefs of different services, senior party leaders, and officials of the prime minister’s office (PMO) were present.